Less than three months ago Electronic Arts was dismissed from the high profile lawsuit brought against them as well as the NCAA and Collegiate Licensing Company. The suit alleges improper use of player likeness through various forms of merchandise and media including video games in which the parties in question conspired to avoid paying players for their rights. A new ruling however looks to have brought EA back into the fold as a defendant in the lawsuit which has former players Sam Keller and Ed O’Bannon at the forefront. •The claim is now not just limited to EA conspiring with the NCAA and CLC to avoid paying current student-athletes for their representations in video games but also that EA Sports agreed to not pay players once they left school as well. EA disputes this idea with evidence that they regularly pay for former players to be on the cover of NCAA titles once they have graduated. •The “unique” and “exceptionally close” relationship between the parties leaves EA as the only licensee to not be limited to using pre-existing media but instead create their own new products off the backs of the student athletes. 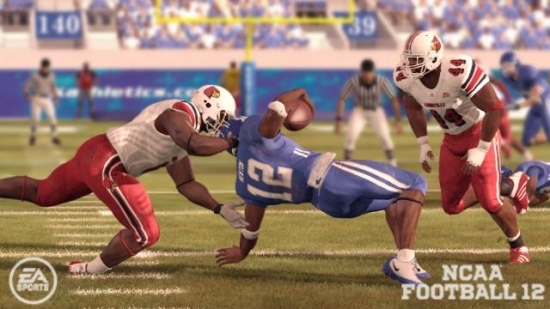 •EA and the NCAA have also had extensive talks about finding ways to use actual player names in products. In the meantime EA and the NCAA have colluded to allow third parties to modify and share rosters. The lawsuit specifically cites “Teambuilder” as the feature allowing for that to take place when they should have pointed at the “EA Locker” feature instead. It’s important to note this does not mean EA has lost the lawsuit, instead the result is that EA will return to defendant status in the case pending another attempt at dismissal within the next two weeks. The actual trial is not scheduled to begin until March 11th 2013. The lawsuit is certain to have significant influence on the future of collegiately licensed video games. Given the decision to make third party editing of rosters a big part of the complaint that now is especially worrisome. Should the lawsuit succeed it would likely mean no editing of players – or at least the ability to spread rosters being hampered or blocked completely – and shipping with a far more generic roster base. This of course unless the even more unlikely scenario of the NCAA agreeing to pay student-athletes eventually comes to fruition.